The “adobe cottage” in San Cristobal in 2001. Life at eight thousand feet! At age 55 the author and his wife, a college professor, trade burn-out for glory on a pure leap of faith. Life in a high mountain village bears no resemblance to the world they left behind, and New Mexico is famous for plans not working like they would elsewhere. 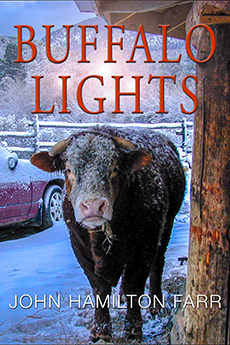 In the 21st-century American Southwest, there’s a bull in the window and a rat under the bed. John and his wife dodge gunshots at Christmas, sink in mud to the axles, and find human bones in the dirt. Along the way he meets a shaman, Buddhist monks, knife-toting tough guys, a guru mechanic, Jesus himself, and the devil’s own dogs. This book covers the years 1999 to 2004. (For 2005-2010, please see TAOS SOUL.) A great deal of the material in this book—covering the first few years of our move—appears here for the first time; the rest comes from several sources. Some chapters are reworked “El Emigrante” columns originally published in Horse Fly (a local Taos publication), others began as “Farr Site” essays published online at Applelinks.com or Zoozone.com, and a few originated as “Emigrante Moon” pieces at JHFarr.com. An improved, revised ebook version of the original classic, featuring over 40 color photographs. The principle differences between this ebook and the print edition are the new cover, the addition of the photographs, and assorted edits. With the exception of the new images and two chapters that didn’t make the final cut, the ebook edition is the same as the original paperback published in 2005. All photographs by John Hamilton Farr. $4.99. About 45K words, photo-illustrated. ASIN B004HILSCU (Kindle), ISBN: 978-0-9830838-2-5. Available at these digital stores.